Winchester, Ind. 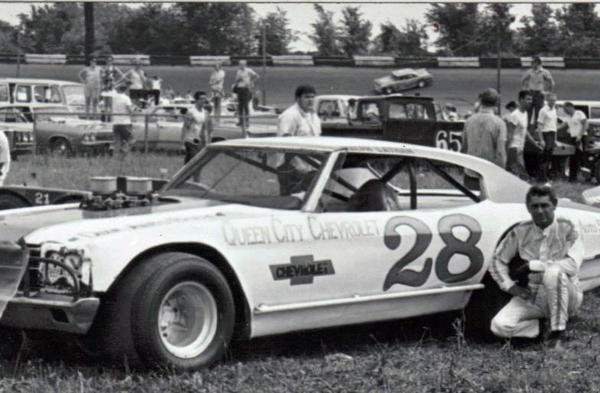 (April 30, 1972) – Ralph Latham made the return of Automobile Racing Club of America (ARCA) new cars to the Winchester Speedway on Sunday afternoon a fast and exciting one as he won the 100-lap feature before a slim crowd of 2,500. 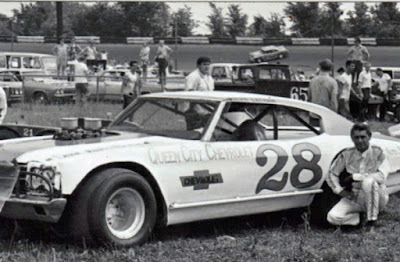 The race was the first for ARCA at Winchester since 1964. Latham, from Cincinnati, Ohio, wheeled his gold and white 1972 Monte Carlo to the checkered flag with a three-quarter lap lead over second place finisher Dave Dayton, driving a 1972 Camaro. It wasn’t all that easy for the popular Latham, however, as he had his hands full with veterans Les Snow and Bobby Watson until minor mishaps eliminated both competitors. Latham trailed Snow for most of the first 74 laps. 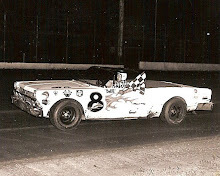 The veteran campaigner had the right front tire on his 1970 Dodge shred at the 60-lap mark. Latham had run on Snow’s bumper since the 17th lap and eased around the faltering Dodge on the 75th circuit and was home free. Three laps later, Watson suddenly dropped from a close third with a broken fan belt after running nose to tail with Latham from the 60th lap. Neil Sceva was third in a 1969 Ford with Snow hanging on for fourth and Ron Hutcherson, moving from his 12th starting spot to claim fifth. The yellow flag was out for 10 laps eliminating Latham’s shot at establishing a new ARCA track record for distance. His time of 37 minutes and 42 seconds was more than two minute slower than the existing mark set by Jack Bowsher in ARCA’s last appearance in 1964. Bowsher’s one lap qualifying record on the high-banked half-mile did fall, however. Snow erased the 20.20 second standard with a lap of 18.79. 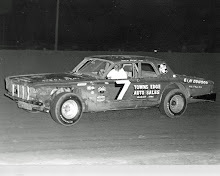 Leonard Blanchard was running a strong fifth for most of the first 75 laps before blowing a right rear tire, won the 4-lap trophy dash in 1 minute and 16 seconds, another track record. Ramo Stott performs a victory dance after winning the prestigious Hawkeye 200 at Hawkeye Downs. 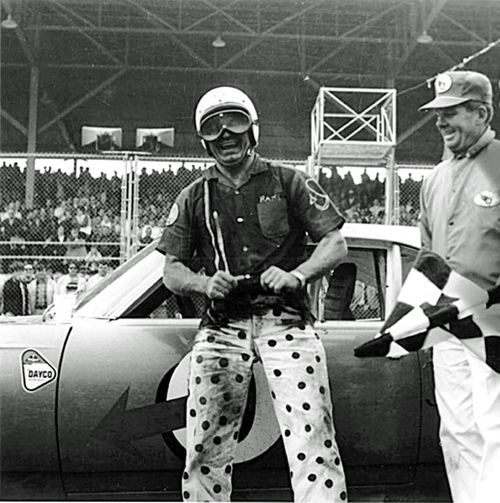 Cedar Rapids, Iowa (April 28, 1968) – Ramo Stott, trying to shed his “bridesmaid” role, whipped Ernie Derr by one and half laps to capture the Hawkeye 200 late model stock car race in spectacular fashion on Sunday afternoon at Hawkeye Downs. A paying crowd of 7,551 watched Stott win hi second feature in three starts this season on the IMCA circuit and increase his point lead over Derr. Ramo is seeking his first national title after three consecutive runner-up finishes behind Derr. The two “Keokuk Komets” were separated by only 15 points entering the 200-lap slugfest. The Downs oval took a good pounding in its initial test run of the year under the onslaught of a 28-car field. All four turns were dug up pretty badly, especially turn three turn, which had “washboard holes” according to Stott. Actually that same turn three had a hand in the turning point of the race. 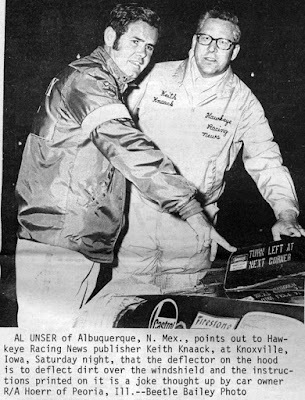 Derr earned the pole in his ’68 Charger as a result of winning the STP trophy dash and was enjoying a 15-second lead over Stott after 97 laps. Then John Zink’s ’65 Chevelle drop a gas tank in turn three. When the yellow caution came out, both Derr and Stott pitted for fuel. Ramo’s car was out first and a few seconds later Derr attempted to pull out as well when his car stalled. Efforts by his pit crew to push-start his car failed and a two truck was pressed into action. By the time Derr got back on the track, Ramo owned a full lap’s lead. He was never seriously threatened the rest of the way. Derr wasn’t talking after the race and it killed the engine while throwing water on it in an attempt to cool the radiator. Local drivers fared well. 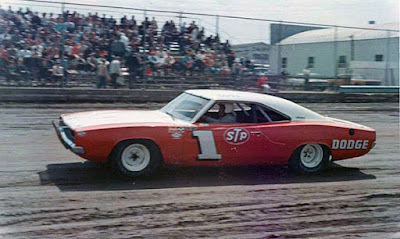 Fred Horn of Marion, driving a 1967 Plymouth, finished fifth while Bill McDonough, behind the wheel of a 1965 Chevelle, grabbed seventh. Race promoter Frank Winkley was presented a plaque commemorating the 20th straight year he has promoted auto racing at Hawkeye Downs. Lou Shepard made the presentation on behalf of the All-Iowa Fairboard. Vic Elson, Ash Grove, Mo. Rich Somers, Stevens Point, Wis.
Cedar Rapids, Iowa (April 26, 1970) – Ten-time IMCA stock car kingpin Ernie Derr raced his 1969 Dodge to his record 14th straight feature victory on Sunday afternoon in the prestigious Hawkeye 200 on the fast half-mile of the All Iowa Fairgrounds. 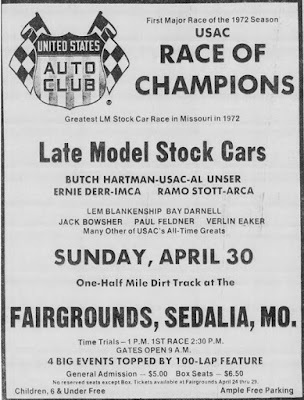 The 14 feature wins dated back to late into the 1969 season. The 48-year-old Keokuk, Iowa, veteran took the checkered flag three laps ahead of Mel Morris of West Liberty, Iowa, driving a 1970 Dodge. Derr completed the 200 laps in one hour and 31 seconds. Ron Hutcherson was third in a 1969 Ford Torino followed by Fred Horn of Marion, Iowa, in a 1970 Plymouth. Derr’s 21-year-old son Mike, in a 1969 Dodge Charger, rounded out the top five. Morris led for 83 of the first 100 laps and had built up a one and a half lap lead over Derr when he ran out of gas. The victory was worth $800 for Derr plus $100 for being fast qualifier. He also collected a $100 appearance fee for being the defending champ. A crowd of 5,570 was on hand. Knoxville, Iowa (April 25, 1987) – Steve Kinser, aboard the Karl Kinser Coors Light Gambler, drove to a convincing win before a huge crowd at the World of Outlaws-sanctioned ‘Spring Opener’ at the Marion County Fairgrounds on Saturday night. The victory, which extended the fleet Kinser’s series lead, paid $8,000 and was his 176th career World of Outlaws’ feature win. 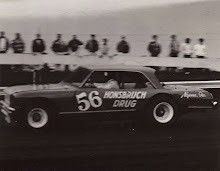 Thee 25-lap event was halted on lap 8 when race leader Bobby Davis Jr. tangled with a lapped car as he entered turn two. The impact sent the Memphis, Tenn., driver tumbling into the fence. He was transported to the Knoxville Area Community Hospital complaining of discomfort in his arm. Kinser assumed the lead on the restart and a two-car battle ensued when Haudenschild came into contention shortly thereafter. 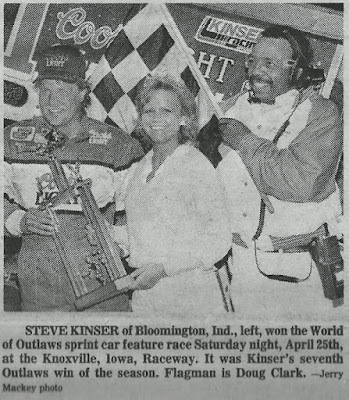 Both use great portions of the half-mile oval as they fought through lapped traffic for the lead but at the checkered flag it was Kinser with the win. Haudenschild earned $4,500 for his runner-up finish. Brad Doty, Mark Kinser and Danny Smith rounded out the top five. Mark Kinser set another new track record in time trials for the weekend, erasing cousin Steve’s 24-hour mark with a clocking of 16.5 seconds. Heat win went to John Tuttle, Ron Shuman, Greg Rule and Danny Smith. The B-feature was won by John Stevenson. Second heat – Ron Shuman, Tempe, Ariz.
Third heat – Greg Rule, Pine Grove, Calif.
Fourth heat – Danny Smith, Danville, Ind. B-main – John Stevenson, St. Paul, Minn.
4. 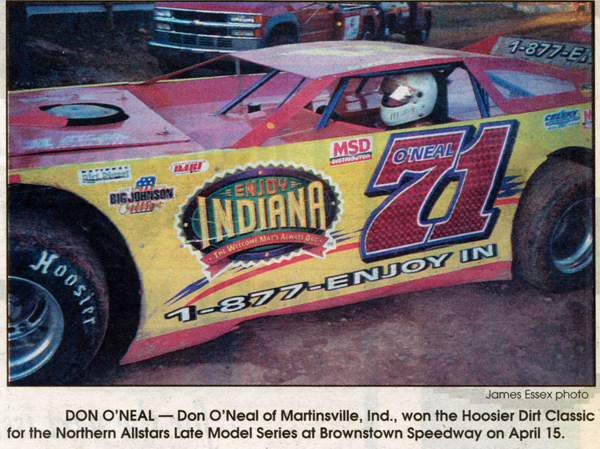 Mark Kinser, Oolitic, Ind. 6. Chris Eash, Woodbine, Md. 7. 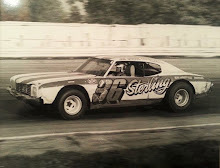 Jimmy Sills, Placerville, Calif.
13. Tim Gee, Jamestown, Ind. 14. Tony Armstrong, Sands Spring, Okla..
16. Danny Lasoski, Dover, Mo. 19. Craig Keel, Weedsport, N.Y.
22. Bobby Davis Jr., Memphis, Tenn..
Vinton, Iowa (April 23, 1972) - Waterloo, Iowa's Bill Zwanziger worked into the top spot at the midway point of the feature event, built a comfortable lead, then escaped some last lap efforts by Ed Sanger to nail down the 50-lap Monza Championship at the Benton County Fairgrounds on Sunday afternoon. Zwanziger's win in the 50-lap grind gave him a clean sweep for the afternoon. 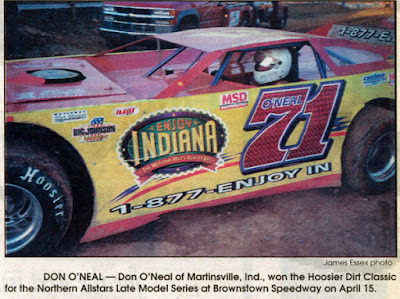 He would set quick time during qualifying, touring the quarter-mile in 17.38 seconds, then nipping Independence, Iowa's Glen Martin the a hotly-contested first heat. It would be the second heat winner, Al Mayner of Winthrop, Iowa, however, that would set the pace for the first 23 circuits in the main event. Zwanziger would put his "foot to the floor" in his Al Frieden-prepared 1970 Nova and slip past the flying physician on lap 24 to take the lead for good. Lap 46 provided a scare for Zwanziger when he was slowed by lapped traffic, and Sanger, seeing a opportunity, applied pressure. But Zwanziger, the 20-year racing veteran did some quick dodging through traffic to re-build his lead to a two-car margin ahead of Sanger at the finish. Despite nagging mechanical woes, Glen Martin would hang in there to finish third while Mayner would settle for fourth place. Larry Wasserfort of Cedar Falls, Iowa, would round out the top five. Omaha, Neb. (April 14, 1973) – Ed Sanger of Waterloo, Iowa, led an impressive late model field for over half of the 100 laps to win the $5,000 Spring Invitational at Sunset Speedway on Saturday evening. The veteran driver, who also won the fourth heat in his 1970 Monte Carlo, took home $1,000 for his efforts. A field of 22 late models started on the extremely rough and wind-polished track. The race was mishap-free, yet only 11 cars were still on the track when the checkers waved. 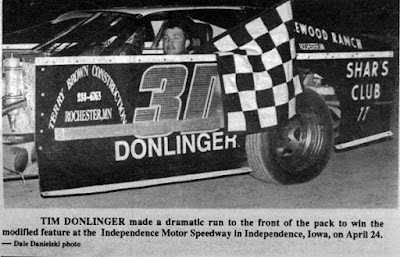 Sanger, who started on the outside of the second row, grabbed the lead from polesitter Bill Zwanziger of Waterloo, Iowa, on lap 48. On lap 53, Zwanziger would lose his runner-up position to Omahan Bob Kosiski, when his 1972 Nova dropped a ball joint and was forced to exit. Kosiski held on to second place for the remaining 47 circuits but couldn’t touch Sanger, who maintained a half a lap lead throughout the second half of the race. Kosiski would pocket $600 for second place. 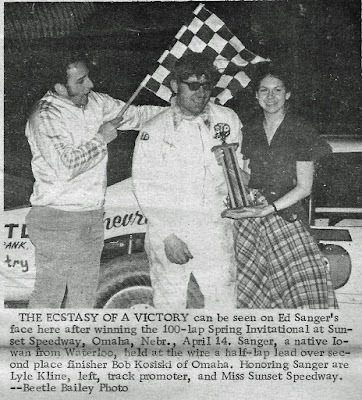 Sanger and Kosiski would lap the field several times, causing scorekeepers additional time, at the conclusion, to tally up the final statistics. 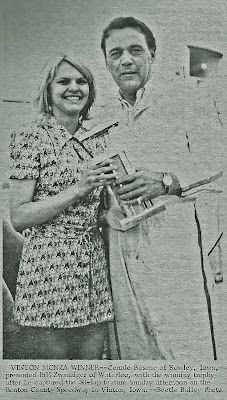 Eventually, a pair of Council Bluff, Iowa, drivers, Ed Morris and Wally Nissen, would claim third and fourth respectively. 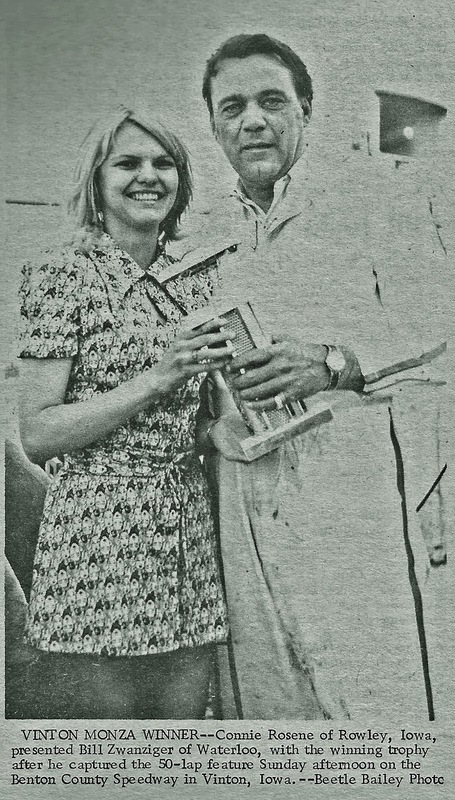 Denny Hovinga of Laurens, Iowa, would round out the top five. 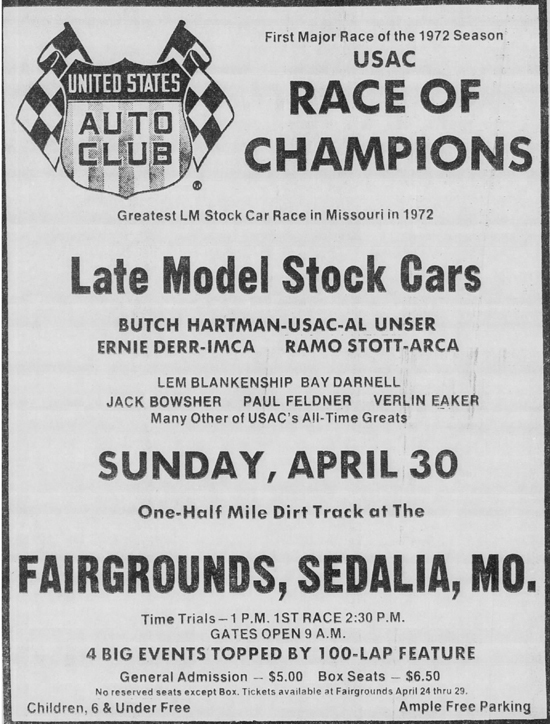 Of those top five finishers, three carried 1972 point championships at various tracks. Sanger at Cedar Rapids, Independence, Oskaloosa and Waterloo. Kosiski at Omaha and Nebraska City. Hovinga at Algona, Alta, Boone and Webster City. 7. Randy Sterner, Blair, Neb. 9. Dave Bjorge, Austin, Minn.
20. Chuck Carter, Bellevue, Neb. Beatrice, Neb. 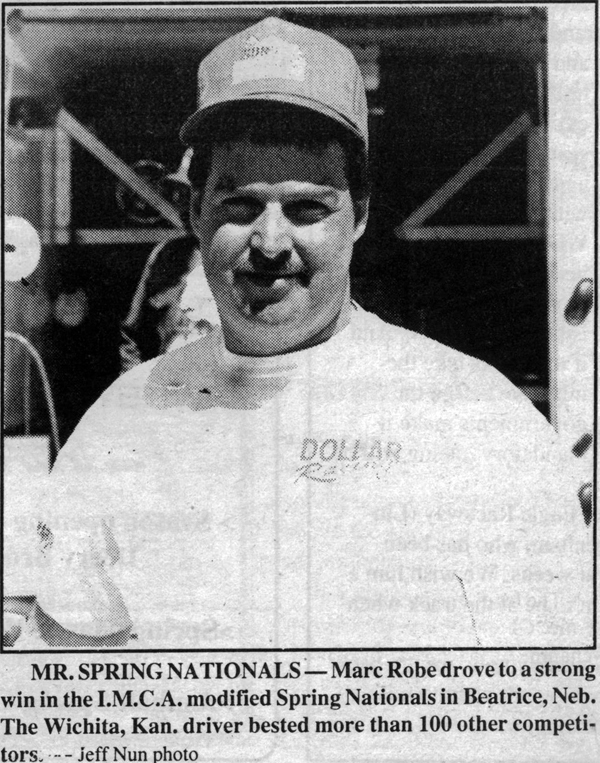 (April 2, 1995) – Marc Robe was just one of many drivers who signed in to do battle at the 2nd annual IMCA Modified Sprint Nationals at Beatrice Speedway, but he was the one who walked away with the glory, the cash, and the championship trophy. More than 100 IMCA modifieds and their drivers showed up for qualifying sessions on Saturday. Robe began the night on a high note, winning his heat and earning himself a spot in the $5,000 to win main event. After completion of the 12 heats, the winners stepped forward to redraw for a 12-car shootout to determine the first six rows of Sunday’s 40-lap main event. Robe drew the pole position, and from there the competition would case Robe for the remainder of the weekend. Robe held off Beatrice’s defending track champion, Kevin Larkins of Adams, Neb., for the win in the 12-lap qualifying dash, earning the pole position for Sunday’s finale, with Larkins set to start outside of the front row. That was as close as anybody would get to Robe as he drove away from the field for victory in the 28-car Spring Nationals feature race. 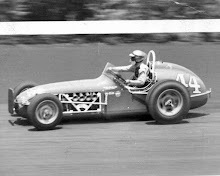 Larkins slipped to third midway through the race as Winona, Minnesota’s Bob Timm came from the seventh starting spot to take the second spot, where he could finish ahead of Larkins, earning $2,500 to Larkins’ $1,200. Kerry Davis of Kansas City, Mo., and Tim Donlinger of Rochester, Minn., rounded out the top five finishers behind Robe, Timm and Larkins. The main event paid $200 to start with more than $21,000 handed out over the three-day weekend. In addition to the $5,000 top prize, Robe also pocketed $250 from Sunoco Race Fuels for the being the top finisher using Sunoco. Larkins collected $125 for being the next highest racer “on the gas,” while Ricky Stephan of South Sioux City, Neb., garnered $75 for being the third highest finisher. Kerry Davis, Kansas City, Mo. Gene Claxton, Kansas City, Mo. Ricky Stephan, South Sioux City, Neb. Kenny Sweet Jr., Wichita, Kan.